Links to all the articles in The Immigrants’ Civil War may be found at the bottom of the page. Defeat at Bull Run had left the Union war plan in tatters. Lincoln had assumed that the Confederate rebellion could be suppressed with fewer than 100,000 soldiers. Now he realized that a single battle by a limited army could never bring the new Confederacy to heel. An army more than 20 times larger than the one Lincoln first envisioned would be necessary. 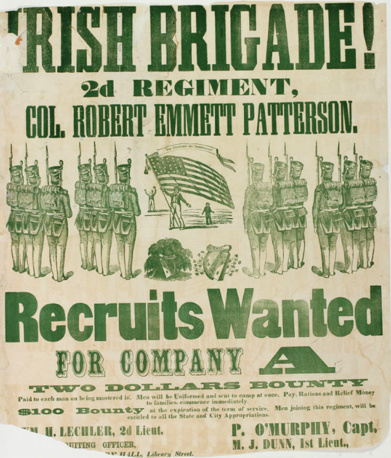 Where once a few ethnic regiments symbolic of immigrants’ support for the Union were welcome, now scores of Irish, German, and other immigrant companies, regiments, brigades, and even divisions were required to do the hard fighting in a long war. The Irish Brigade would become one of the most recognized and certainly the most remembered of all the ethnic units. The recruiting effort worked, and thousands of Irish joined up and were sent to train at Fort Schuyler, located at the modern-day SUNY Maritime College in the Bronx. Meagher, with only half a year’s military experience, was made a brigadier general and Irish America was given a new way of melding its dual identities. Ceremonies marking the departure of the brigade’s regiments to war were attended by thousands of cheering immigrants and native-born alike. Whether the Irish would transition from parade ground heroes to hardened fighters would be determined in the wet spring and bloody summer of 1862. The song “The Irish Volunteer” appeared about a year after the Civil War began. Songs like this could serve as recruiting tools and morale boosters. The song sounds transnational themes common in Thomas Meagher’s speeches. It opens with the energetic immigrant soldier singing about his father who “fought in ’98”—the Irish rebellion of 1798 against the British—and implies that the modern Union soldier was fighting for the same “liberty so dear” that motivated the 1798 rebels. The chorus says that the Irish Union soldier will fight for “the flag we all revere,” not the American flag but the Irish green flag with a gold harp at its center. Loyalty to Ireland and loyalty to America are mixed together as though identical. The next stanza reminds the immigrant that he was driven from his homeland by the English “oppressor” and that the only country that provided asylum was the United States. It also boasts that the immigrants have built up their own society here. The third stanza depicts the Irish Volunteers as distinctly working class. The volunteer throws down his “hod,” a carrier for cement or mortar, and his shovel, indicating that he is a construction worker or day laborer. The next stanza recalls the refusal of the 69th to parade before the English Prince of Wales in 1860, which had nothing to do with the Civil War, but is used to create an association in the recruit’s mind between fighting the Confederacy and fighting the British in a manner similar to that in the first stanza. The song ends by hailing Union General George B. McClellan, a Democrat, who commanded the Union army heading for Richmond. It ignores Abraham Lincoln, a Republican who two out of three Irish voted against. I was born among old Erin’s bogs when I was but a child. We’ll fight and fall beneath its folds, like Irish volunteers! Chorus—Then raise the harp, etc. I cut my sticks and greased my brogues, and came o’er to this land. Be jabbers! I’ll stick to them like bricks and an Irish volunteer. Chorus—Then fill your glasses, etc. And joined the good old “Sixty-ninth,” like and Irish volunteer. Chorus—Then fill the ranks, etc. They wouldn’t give a d—n for kings, the Irish volunteers! “But the divil take nobility!” says the Irish volunteer! Chorus—We love the land, etc. He’ll lead us on to victory, the Irish volunteers. Chorus—Then here’s to brave, etc. Chorus—God bless the name, etc. 1. The Irish Brigade in the Civil War by Joseph Bilby, Combined Publishing, (1995) Chapter 1. 2. The Irish Brigade and Its Campaigns by D.P. Conyngham, McSorley and Company (1867) p. 50. 3. The Irish Brigade in the Civil War by Joseph Bilby, Combined Publishing, (1995) Kindle location 219-220. 4. The Irish Brigade and Its Campaigns by D.P. Conyngham, McSorley and Company (1867) p. 53; . The Irish Brigade in the Civil War by Joseph Bilby, Combined Publishing, (1995) Kindle location 228. 5. The Battle Cry of Freedom by James McPherson, Oxford University Press, (1988) Chapters 10 and 11. 6. Thomas Francis Meagher by Robert Athearn, Arno Press (1976). 7. Brigadier General Thomas Francis Meagher: His Political and Military Career by W.F. Lyons (1870) pp. 83-84. 8. Brigadier General Thomas Francis Meagher: His Political and Military Career by W.F. Lyons (1870) p. 102. 9. Brigadier General Thomas Francis Meagher: His Political and Military Career by W.F. Lyons (1870) p. 83. 10. The Irish Brigade and Its Campaigns by D.P. Conyngham, McSorley and Company (1867) pp. 60-62.